Microsoft Office Online programs are a part of most Office 365 plans. 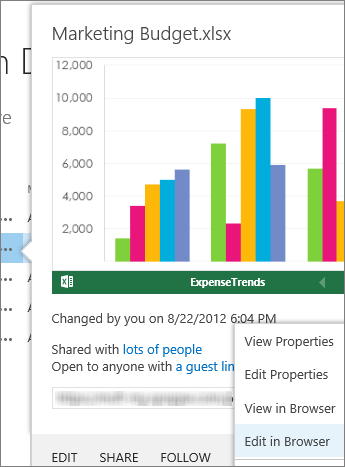 Office Online makes it easier for you to work in the cloud because Word, Excel, PowerPoint, OneNote, and PDF documents open in your web browser. Sign in to your organization’s Office 365 site to get started. When you use the three-dot Open Menu in a SharePoint library, Office Online shows a preview of the document, and provides another Open Menu with commands for viewing and editing the document in your browser. To get started, sign in to Office and save your document online. Your organization’s plan gives you libraries for storing your documents, or if you have Office 365 Home, you have personal online storage at OneDrive.com. Note: Not all Office 365 plans include Office Online. What’s available depends on what’s been configured by the person in charge of Office 365 in your organization.